The BR Beer Scene: The Latest Reviews! I already talked a bit about the Hitachino Nest White Ale I picked up on the last beer run to Calandro's, but now that I've had a chance to go through that selection of brews, I figured it was time to share my thoughts, good and bad, on the other 4 different beers I picked up. 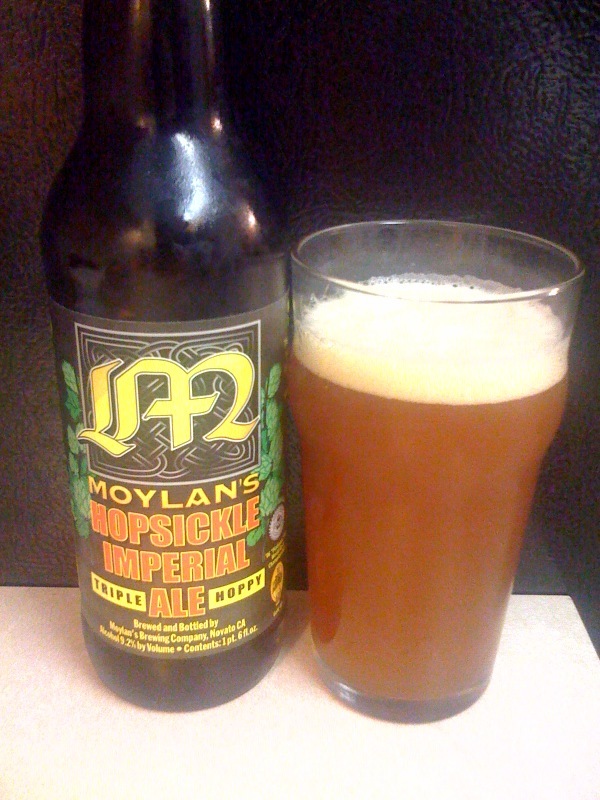 The first one I tried was a Moylan's Hopsickle Imperial Ale. 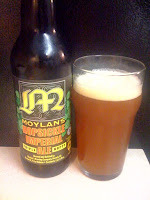 Moylan's is a brewery/restaurant out of Novato, California that has been highly awarded over its 15 year history. I'm usually a fan of hoppy beers, so even with a hefty $10.99 price tag for a bomber, I figured I'd give it a try. The beer has received high regards on BeerAdvocate, with an A- average rating, but I wasn't as impressed. The citrusy grape-fruit-esque hops dominated too much for my liking, with not a lot of balance in the flavor. If you're a big fan of super hoppy beers give this one a try, but for my palate there are better IPAs and IIPAs available for a better price. 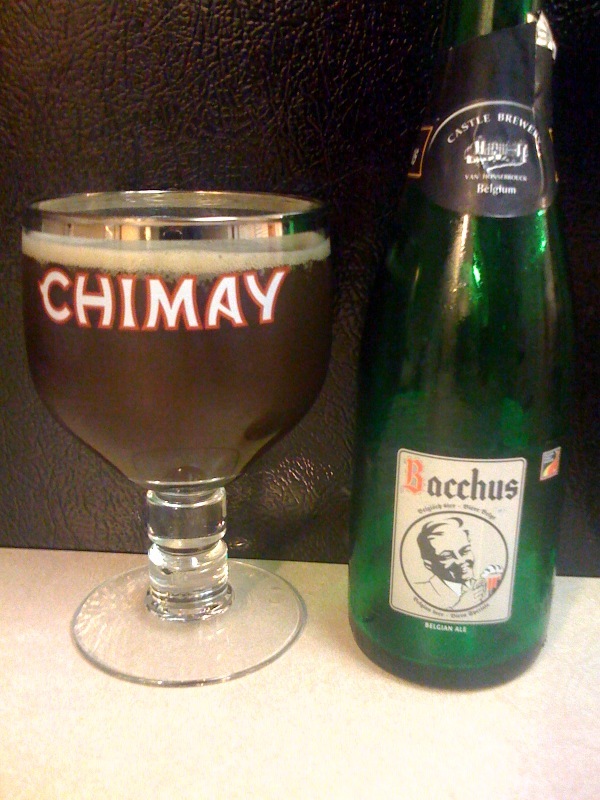 The next one I broke out was the Bacchus Red Ale from Brouwerij Van Honsebrouck in Belgium. The brewery does the traditional range of Belgian ales (tripel, quad, etc.) as well as a wide variety of fruit beers and lambics. This particular beer was in the style of a Flanders Red Ale which is described as "infamous for their distinct sharp, fruity, sour and tart flavors which are created by special yeast strains." This was my first taste of the style, and the sour and tart flavors are no joke. In fact, they were so potent it really took away some of my enjoyment of the beer. The aroma was absolutely fantastic, but the sour flavors were just too strong for me to really enjoy. At only $5.79 for a 12.7 ounce bottle I'm glad I learned some more about a style I'd never tried before, but I don't feel the need to go stock up on these. Next up was the only 6-pack I bought... the Eel River Organic IPA. I had previously had both a great experience with the Eel River Raven's Eye Imperial Stout (fantastic stout) and a bad experience with the Eel River Acai Berry Wheat which left me a little underwhelmed. Even still, at $11.79 for a 6-pack I was willing to give this one a try. The aroma struck me as more of an APA than an IPA, with a good balance of malts and hops, with the caramel flavors coming out the most. The taste was more hop-dominated, but not so bitter that it took away from the enjoyment of the beer. I was impressed overall, and this is certainly one I'd consider picking up again. Last up was a beer from New Zealand, from a craft brewery I even mentioned in the New Zealand World Cup of Beer post back in the Summer! 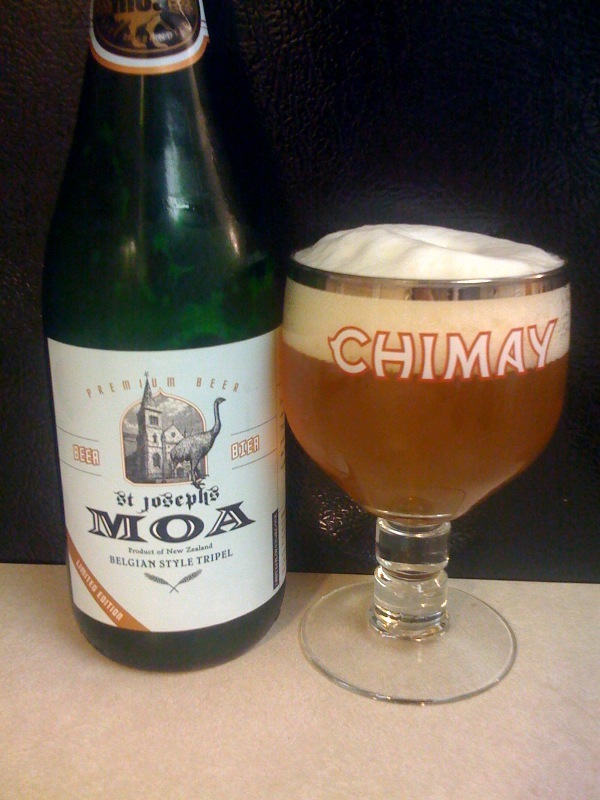 It was from the MOA Brewing Company, their version of the Belgian ale, their St. Joseph's Tripel, and at $7.99 for a bomber it also made the cut as a beer to try. Tripels are one of my favorite styles, and I've tried versions from all over the world, so I was excited to try this Kiwi take on the style. 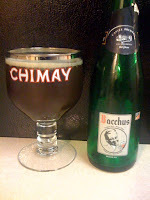 On first glance, it had all the look of the Belgian counterparts... hazy amber color with a frothy white head. 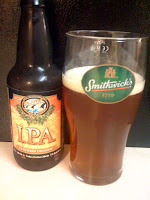 The beer had a very floral aroma, and well balanced too with the hops and some malts and spices. On the tongue the hops came out stronger, with the floral flavors and spices dominating the front of each sip and the caramel malts just lingering slightly on the aftertaste. An above average attempt at a Belgian tripel, but not quite on par with the authentic products, as to be expected. 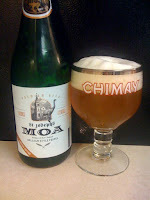 In New Zealand it's probably a real treat and quite affordable, but here it doesn't set itself apart from the Belgian ales and other North American attempts at the style. Another successful beer run for me... found a brewery (Eel River) that I want to explore further, and got my feet wet with the Flanders Red Ale style. Unfortunately, my fridge is about empty... guess I need to get some more!